With a background in child and youth development, and elementary education, it's important to Raina that our work with children is founded on current best practise and educational approaches. The "Three I's" are a framework Raina developed that helps us monitor, maintain, and improve the work we do with children. The "Three I's" are based on principals surrounding the giving of Information, the importance of Imagination, and the purpose of Inspiring. 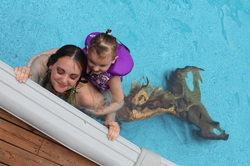 Mermaids take a play-based approach to learning. We know that kids learn best when they are actively engaged and having fun. We use imagination as a tool to teach, engaging the kids as "characters" and encourage them to use their imagination in play, learning, and for healthy development. We also aim to teach parents just how important it is to use your imagination- even as an adult. This fulfills the Imagination component of the "Three I's". Mermaid value the important of information and relaying up-to-date knowledge about our ocean to children and adults a-like. Sometimes, learning about issues such as global warming can be scary for a child. Mermaids bridge the gap to provide children with empowerment when it comes to changing their world, up to date information, and present it in a non-threatening way. Raina is also constantly attending workshops, professional development, and speaking with global leaders in the conservation field. This fulfills the Information component of the "Three I's". Finally, mermaids seek to inspire. Each mermaid overcame their own personal obstacles to be the woman and the fish she is today. Raina has overcome personal illness, mobility issues, and a troubled childhood. Mermaids want to leave an impression with kids an adults alike that you can achieve your dreams and overcome the bad things in life. Raina often delivers motivational speeches on the topic. This fulfills the Inspiration component of the "Three I's".